From the expo to post race this run was very well organized and ran very smoothly. The expo was a lot of fun and there was never a wait for anything. Every person working was pleasant and helpful! Race day parking was easy and the shuttles were a plenty! No one had to wait for a shuttle because there were so many! With the temps as cold as they were, that was such a great thing. The corrals were easily navigatable and with so many people it could have been a disaster but it wasn’t! Course scenery was great and the community support was awesome the entire way! Overall I was very pleased and happy with my experience running this race and look forward to 2019! I just have to start off by saying that this race was incredible! I loved every second of being out there on that course. I honestly felt like I was running through a tiny town with all of the community support out there on the course. I never felt like I made a turn without people there cheering, giving out high fives or even sharing their sprinklers with the runners! We got there on Friday, June 1st and headed straight to the expo. We did get there near the end but not the VERY end and a lot of the booths were either clearing out or already gone. That was rather disappointing because I had seen social media posts all day about how awesome the expo was. I was sad that I didn't get to experience that and would hope maybe in the future they would require booths to stay open until the expo is scheduled to be over, just for those of us who don't have the option of getting there right when it opens or during the daytime hours. The morning of the race we headed to the start line. Parking was rather simple and we were able to get a spot extremely close which was nice since we don't really know downtown Kansas City that well! The race was postponed by about a half hour due to weather, ultimately that was the best choice and I can say with all honesty I'm very glad the RD and staff made that call! Like I said in the beginning, the race was just awesome. So much support and smiling faces all around, it made it easy to be happy through one of the hilliest courses I've ever raced on! I was able to PR this race as well and I know it had a lot to do with the support and community just pumping everyone up at every single turn! The post race experience was beyond anything I've ever experienced before as well. Such a cool area to hold the after party, plus all of the amenities offered were more than I have ever been offered at any race previous to this one! I ended up hanging out much longer than I usually do at the after party to just take it all in. I'm already planning on heading back again next year to tackle the hill once again! I can’t say enough good things about the Go! St. Louis race. I look forward to this weekend all year long, as a runner I couldn’t ask for a better ran race! 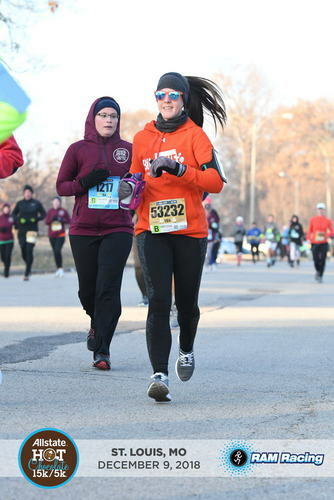 Not only is the race ran smoothly, the course is my absolute favorite! There’s absolutely no boring spots on the course, there’s always cheering and it’s just an awesome upbeat atmosphere!!! 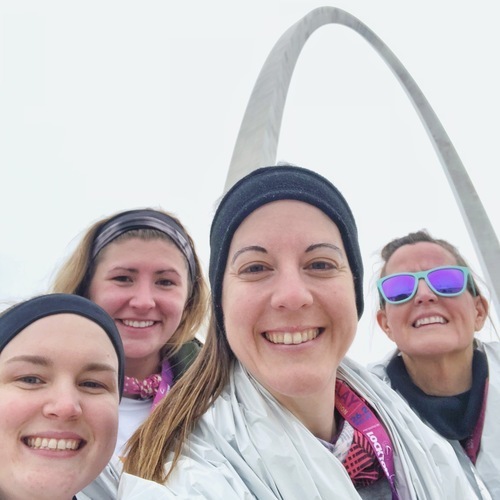 If you are looking for a race experience that will knock your socks off, come to St. Louis is April of each year for this race! You won’t regret it!! 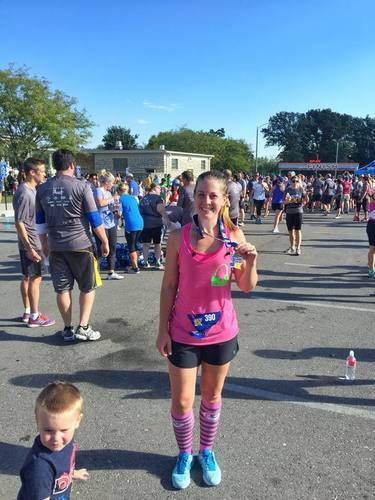 "Great first time trail race!" I've been wanting to get into trail racing lately and I knew I needed to find something a little shorter than a half or a full to start out with. I found this Quivering Quads II (the original Quivering Quads is earlier in the year which I missed out registering for), so I knew I needed to jump on registration. I am so glad that I did! There was constant online updates on the race, I never felt like I didn't know what was going on. 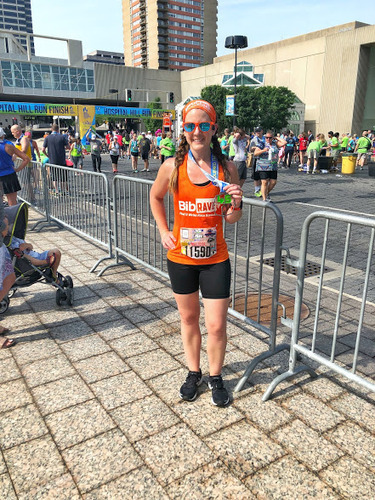 I had my Mom do this race with me as well, and Fleet Feet here in St. Louis really had our backs on any and all concerns we had! Parking was very well marked and we were able to have a shuttle take us from our car right to the race start. There were plenty of port-a-potties, so getting a last minute bathroom trip was easy (let's all be real, this is a huge issue and I've been at races that didn't have enough bathrooms)... Also the pre-race set up included fire pits to help keep warm and loose before running! The race start was super well organized, only allowing 25 runners at a a time to head out with a 2 minute window in between each group. We were never clustered together and I never felt like I was in the way of anyone else. We were instructed on passing and the proper way to do so before the race as well! I just felt really well informed before running this race and it really helped to boost my confidence going in! 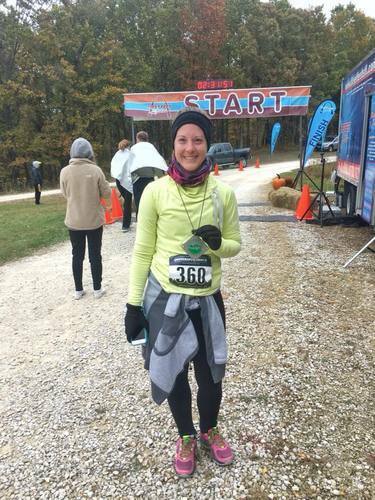 The course was absolutely gorgeous and although this was my first trail race I feel like the difficulty was just right for a beginner but also challenging enough for someone wanting to get a specific time! I also need to shout out to the aid stations, they were so well stocked and manned that it was just so incredible, also the volunteers were super motivating which was awesome as well! All in all I have to say this race was so well organized, planned out and implemented. There were never any questions or concerns because any possible thought I may have had, was answered or addressed by all race social media platforms! I will definitely be running this race and the original Quivering Quads next year and if you're in the area (anywhere around the St. Louis area really) I highly suggest you look this race up next October! "Great way to kick off the St. Louis Blues season!" All in all I was super happy with this race, would recommend it and run it again in the future. I know this was the first year so there were bound to be some kinks, even though the local Fleet Feet put on the race, it's seemingly hard to hit a home run first time out. The course was nice and scenic, however my Strava had me at about 3.5 miles. I know courses aren't always perfectly mapped, I always tend to run over or under but only by .1 miles, that was a bit more than expected. I would also have like the start and finish line to be a bit better gated or roped off. It was difficult starting and finishing with others families all around, standing right on the course with their loved ones. Also, after the race there wasn't a clear direction we were to go in to receive our medals. Thankfully I found a lady just standing around holding some, not even making it known she had them. By the time my Mom finished we couldn't find any to come to hear they had ran out. The race had over 1,000 registrants, however my mom finished right in the middle of the pack and didn't receive a medal, I feel like they should have ordered a little bit more as only half of the runners/walkers got medals. I was super happy with the before and after party set up area, the booths were nicely set up and appropriately spaced apart to where it never felt like we were at all crowded. The announcements were nice and clear as well, also having some retired hockey players there taking pictures and signing autographs was awesome!! My Dad was thrilled to meet some players he idolized growing up. All around the event was very family friendly and I feel that with the tweak of a few minor things it could run a lot smoother and be that much better!! !